European Alternatives (EA) is a transnational organisation and network whose mission is to promote ‘democracy, equality and culture beyond the nation state’.1 On a dark February evening in 2014, we met up with Daphne Büllesbach, Citizenship and Democracy Director at EA, and Luisa Maria Schweizer, City Coordinator of the local Berlin chapter of EA. Daphne has a background in political science and European Studies, Luisa is a studied anthropologist. Both co-founded the Berlin group and were happy to tell us more about their current activities, motivations, missions and goals with EA. How did you guys get involved with European Alternatives? DB: I studied with one of the founders. Back then, it didn’t exist yet but I knew Lorenzo Marsili, one of the co-founders. By chance, I was actually in Kenya at that time, when I received a newsletter where EA was mentioned. I stumbled upon my study colleague’s name thinking, hey, I know this guy! I checked the website and saw the open call for participation for the foundation of the Transeuropa network. This happened back in summer 2010. That’s how I got involved with it. It’s been around three years now, I was elected Co-Chair of the Cooperative (the grouping of all city coordinators) and I sit on the trans-national board of EA. And for the last 6 weeks, I have had a full-time position with them! LMS: I also got involved via the university. I was part of a research project called Other Europes2 and it dealt with imagining new spaces with urban actors and such. During my research on the agency of non-governmental organisations within the EU, I came across European Alternatives. I contacted them for an interview and first I got involved with them as a researcher, conducting interviews, participating in their meetings to do participatory observation and writing about all of it. During all of this time, I had difficulties to draw a line between doing my research and getting involved. After the project, I just continued attending their meetings and stayed involved ever since. I am on the board of the Berlin association and also a founding member, but I have never had a paid position. When did you become a formal association and why did you decide to organise yourselves formally? DB: We formed the association in summer 2012. It was a process of one and a half years, it took ages! We took this step out of pragmatic reasons. If you want to take bigger steps with a group, you need a structure within which to move. How is European Alternatives structured in general, being a larger international network with many local groups across Europe? DB: The basic idea is the Transeuropa network,4 which was initiated in 2010. People were either asked directly to join or joined because they got to know about it by chance, as I did. At some point, we had representatives of EA in eighteen cities all over Europe with local groups around them. Some of them institutionalised themselves, such as the groups in Barcelona, Amsterdam and Berlin. There is EA Ltd., the mother organisation based in London where it was founded in 2007 (with the idea of running the London Festival of Europe — the predecessor of the subsequent Transeuropa Festival), followed by the formalisation of the groups in Paris, Rome, and Cluj-Napoca. Those are the four original cities in which the Transeuropa Festival5 took place twice before becoming bigger and more known. When did the first Transeuropea Festival take place? DB: The very first one took place in London in 2008. Then, in 2010 and 2011, it was organised in the four cities mentioned above. The festival in 2012 was the first very big festival with around twelve participating cities in which we also took part. DB: It is one of the founding principles of the two co-founders Niccolo Milanese and Lorenzo Marsili. The two were living in England then and were worried about the Europe-sceptical tendencies that were developing at that time. They had the exact opposite opinion and wanted to create something to oppose these developments. By weaving-in artistic elements and formats, they wanted to reach out to a large number of people. They were very successful with their concept in London. When the support from the British Council and the German Goethe Institute was confirmed, they knew: “OK, let’s do it”. That’s how European Alternatives came into being and it’s been growing ever since. What happened during this first festival? DB: Good question, I wasn’t there yet! (laughs) It was probably not that different to what is happening these days. There were classical debates about topics that we’re discussing today. For example, the question of how England positions itself towards the EU. I studied in London myself and I have to say that it’s quite rare to find people who openly declare themselves as Europe-friendly. It’s interesting that EA found its starting point in London, while becoming so important in other European countries. What’s the background of its founders? LMS: Lorenzo is Italian and Niccolo British, from Wales with Italian ancestors. They both were really young when they founded EA. Lorenzo is only turning thirty this year, and Niccolo 29, so they were around 22, 23 back then. How do people know about European Alternatives, how do you attract new members? Do you have a certain strategy of getting people involved? DB: It has always worked quite well with our group in Berlin, I don’t think it’s like that in all of the other cities. Berlin works quite well in comparison to other groups that struggle to find enough volunteers because it’s a city people often move to to find new projects and inspiration. That would be my next question: how do you keep people on board? DB: Engagement strategies, the big old question! Well, clicktivism6 for example would be pretty much the opposite of what we do — we don’t want to simply activate people, we also want to interact on an interpersonal level to empower them. I believe we’ve managed quite well to establish these kinds of contacts. Of course, this requires a lot of engagement and time. Our main strategy is to offer interesting projects where people can get involved, such as the festival. It’s a recurring event which always gets people excited. Of course, it will be difficult to keep people’s interest up until the next festival in 2015 with a break in 2014, but it has worked quite well over the past few years. Members can also suggest something and participate with their own ideas during meetings amongst our various local groups. So far, these ideas have been traveling and were communicated quite well amongst our network and the employees of EA – don’t you think, Luisa? LMS: Of course, one tends to have the ideal that all people are as enthusiastic as oneself and are as happy to participate and contribute in the same engaged way as one is. This ideal is naïve. It does not work out in most cases. People are always subject to changes in their life circumstances, such as having a high workload in their studies or workplace, getting pregnant, losing interest and such. I believe the trick is handing over ownership to people by giving them the possibility to become part of the project. If you bear responsibility, you become irreplaceable. This is really crucial. We already had people come by and you could immediately tell they had no genuine interest, but an engagement motivated by polishing their CVs. This is not the idea. I agree about the sense of ownership being crucial to any kind of work. European Alternatives is basically offering a platform to turn project ideas real. DB: I think this is our formula for success. It gives us the possibility to get people’s commitment. The two of us got engaged with EA in a similar way – we wanted to start a project and needed to found an association in order to do so. Last year, we filed an independent project application for which it was really useful to have EA in the back. Applying for grants as an individual is almost impossible. It works in both directions: we need the organisation, and the organisation needs the ideas. Of course, there can be dry seasons without anyone wanting to commit. LMS: It’s something we’re trying to sell all the time – the possibility to turn your ideas into reality, being supported by a basis of knowledge, hunger for activism, enthusiasm to change something… Being able to pitch your idea and to find people by articulating your thoughts and develop them further, using the Europe-wide network is a rare opportunity! Sure, it quickly becomes boring if this opportunity is not taken. The projects you’re currently working on, are they all being realised network-wide or do they depend on local groups? DB: Both. For example, the project Making a living7 was initiated by a guy in London. By spreading the word in the whole network, other groups joined the project as well. This was basically a peer-to-peer project because they didn’t need the organisation. The project only happened through the support of the network. Therefore, the concept that ideas spring from the network is really important to us. We put a lot of energy not to lose this potential by keeping people motivated to be part of it. It’s also motivating to see things happening in the individual local groups if it’s well communicated. LMS: Yes, definitely! It’s much easier to contact a local group in Bulgaria, for example, if I know what they’re up to. We all share a common basis, therefore it’s easy to cooperate over the distance. DB: It sounds quite simple, but if you think about it there are not many organisations that invest such amounts of time and resources into their networks. When I was working for another organisation, we always struggled to find partners in other countries to collaborate on transnational projects. This is never a problem with EA. Don’t get me wrong — we’re not a network to file successful grant applications, but the people in the network are a real treasure with potential for continuous growth. I am curious myself to know how it will all continue, especially with upcoming generational changes. Myself and all the others still belong to the first generation, but what happens when all the people who built up the whole thing leave? How do you communicate within the network? Are there regular physical meetings? LMS: Mainly, we communicate via email and Skype. The members are informed through newsletters and such, through which also non-members are informed about events and projects. When I started with EA, we met around 8 times per year somewhere in one of the participating cities to work together over a weekend. I find these physical meetings very important because you actually get to see people and have a direct and more engaging contact. You work a lot more effectively face-to-face than over distances. How many people are employed with EA and how do you manage financially? DB: We are around eight to ten people, not all of them are working full-time. How do we manage financially? In short: through successful grant applications! Niccolo and Lorenzo are real champions with this, otherwise we would not be where we are today. Of course, the project is great as well. So far, most money came from the European Union Commission, open calls to which we respond. But we also get quite a bit of private funding from foundations, such as the Open Society Foundation8 for example, or the European Cultural Foundation.9 All the employees are included in the challenge of finding new money sources. My salary is only secured until October. It has always been a bit like that though. Somehow, it has always worked out so far. Of course, it’s all a bit insecure because of the dependency on grant givers, not producing our own profits. With your mission, you try to be open to all – do you still have some sort of target group or specific people you are trying to reach out to? LMS: We don’t have any target group. Yet, we always reach a certain group of people: academics, people between around twenty and thirty-five years old. We are aware of that, but it’s not our goal. We try to deal with this fact. One challenge for example is language — when there is a presentation, it should be in German, otherwise local people would not be able or attracted to join. On the other hand, it immediately becomes exclusive for those who don’t speak German. It’s difficult to deal with such things. DB: We try to be inclusive and participative at all times. For example, when we speak about Roma rights, we have to include those people who are directly affected by such problems and therefore speak with them, not just about them. We organised round tables in order to create the Citizens’ Manifesto with the idea in mind that participating has to have very low barriers, otherwise minorities would not be interested. It has worked really well; in Bulgaria and Romania, we had citizen tables with locals actually participating. When it comes to target groups, a lot of grant givers always complain that we are a multi-issue organisation. They ask us to concentrate on one topic to make everything simpler. We always insisted on being a multi-issue organisation though because our overarching mission of ‘equality, democracy and culture beyond the nation state’ cannot be reduced to one topic. All the topics we’re dealing with are interconnected. It’s also about creating a post-national construct. We need to think about what this could actually look like. There are lots of people writing and thinking about this as for example Robert Menasse, or the Young European Federalists (JEF). Our mission is relatively radical and wide with no specific target group and we address many issues. It allows you to react quickly on current and ongoing topics. LMS: Yes, I agree with all of that. Still, I sometimes find it difficult. I understand the claim of EA to only be able to achieve our mission as a multi-issue organisation. At the same time, it becomes difficult to be an expert in all of these areas. It would work better if there was an overarching organisation with lots of small ones underneath, all being experts in their respective fields. I sometimes feel like I’d like to express holistic views on everything, but I also know there are certain areas that are just not mine. DB: This is exactly the founding thought of our organisation and our founder Niccolo; exactly because of this, we cannot turn into a single-issue organisation. The idea is that every citizen should be able to express an opinion — being an expert or not. People should always have the possibility to express themselves and feel empowered to do so. EA aims to empower people to express their opinions on political issues without having studied political science. None of us feels like an expert on all of these issues — but maybe that’s exactly what we need to free ourselves from. We can sit at a round table and talk about Roma issues without being well-versed in the topic simply by expressing our opinions. It’s all about participating, not about being an expert in order to keep barriers low for participation. It’s a nice thought— many people hold themselves back from participating by thinking to be unable to grasp what politics are all about. I’d be interested to know more about the methods you used to involve people in the making of the Citizen Manifesto, it seems to have worked out really well to get people participating? DB: It was the simple method of the World Café.10 We organised around 300 round tables over 3 years about a specific topic. In the first phase, opinions and ideas were exchanged which were then developed into concrete political proposals by experts in a second phase. In Berlin, we had a session on ‘welfare’, where experts from the basic income movement brought in their expertise. In my opinion, this method has worked quite well. Of course, we could have reached out to more people, but we’re happy we got thousands of people involved and now have a book in our hands to be shared with others. DB: The basic thought about the project is to turn its initial concept around. Instead of people coming to where we are, we literally drive to where they are. We’re currently working on the details, then I can tell you more… (laughs). Are you planning to use specific participatory formats? DB: The bottom line of our participatory success is the network, after all — people who were once engaged with us can now locally coordinate and organise amongst their networks or people and initiatives. It would be impossible to coordinate all of it from elsewhere. With formats, you probably mean such things as ‘fishbowls’ for discussions etc., but that’s not the plan for this trip. We don’t want to drive to market squares and open up a stand to discuss the manifesto. It could work a few times maybe, but we’re more interested in using cultural interventions within our work. It’s always been important to us to involve performers and artists. We’re currently in touch with Kim, who’s quite an expert with such things. Last year, we organised a beautiful performance called AIR Time12 which took place simultaneously in different cities around Europe. It was a very exciting format. Of course, it has its limits but it has the potential to be developed further. In ‘new-German’’, you might call it a ‘flash mob’, a one-off thing that can be reproduced. Simultaneity is an important momentum for us at EA; to do things trans-nationally and possibly simultaneously. 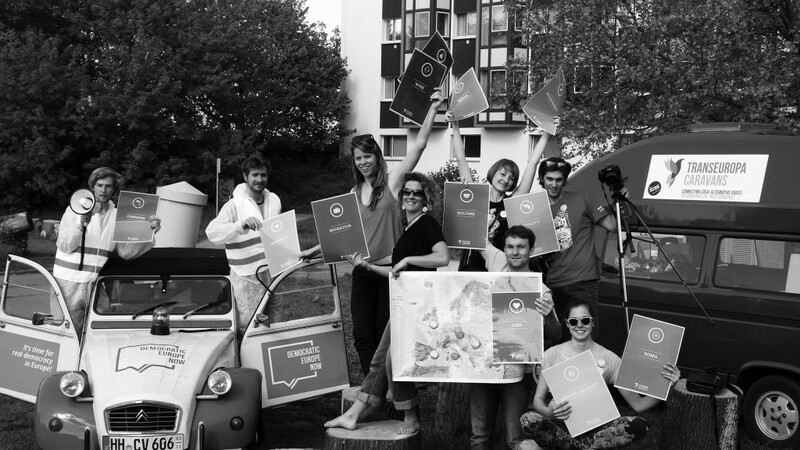 The Transeuropa Festival happens simultaneously, the Transeuropa Caravan project happens simultaneously — it was a conscious decision not to drive through Europe over a period of three months, but instead to have six teams start simultaneously in different cities. It shows the many layers of the project and re-enforces the idea of collaboration. I’d be interested to hear more about EA using cultural formats to communicate political content, rather than writing academic articles by making things visible on the street. LMS: I think culture makes things much easier to approach, you see something concrete and a much wider range of sensory perceptions are activated; I can hear, see, participate, feel. I believe this is something very important. Artists are often naturally concerned with the given political conditions. Collaborating with them, we double our audience — we reach out to both the politically and the culturally interested. DB: We’re also hoping for artists to take over this role, being intellectual people others listen to. It’s not an explicit demand from myself, but I’d like to see more artists doing this! You managed to get artists of quite high international profile such as Tania Bruguera13 on board — how did you do it? DB: I believe Emanuele just wrote her an email and she immediately said yes?! LMS: The artists we got involved are concerned with very similar topics like us, so it was quite easy to convince them. It also depends on how much you expect such people to do for you. They can support our project, for example with a protectorate as consultants on the board of the organisation. DB: Tania Bruguera has been amazing! I didn’t know her from before, but she is putting in much more time than we asked for, meeting our local group in Paris and such. It is very motivating to see motivated people joining us. I really find this kind of collaboration exciting! I wonder how ‘official politics’ perceive what you do? LMS: I feel like we get a lot of positive support in Germany. If you say you’re young and engaged for Europe, most political foundations and old-established politicians love you already, even if they don’t exactly know what we do. They have this image of an old Europe as a space for peace, without borders and war… so far, we haven’t really gotten any negative feedback, no? DB: We have quite strong contacts with people in the European Parliament, who are very helpful as a bridge to what you call ‘official politics’. It is true that we have less contact with conservative politicians, but they are usually less interested in what we do. Is there anything that went totally wrong during your time with EA? What did you learn from it? DB: There was this one very embarrassing thing with a movie screening during the Transeuropa Festival three years ago. We were in touch with a Roma organisation who wanted to show a film on Roma rights. The portrayal of the Roma was stereotypical and superficial. I hadn’t watched the movie before, which was a big mistake. We had arranged everything in a café, but when we first previewed it internally we decided it was impossible to show. One of our video teams had created the movie; of course, they didn’t mean it that way, but I think you have to be very careful in the portrayal of a minority as an outsider. You mentioned the term empowerment before, what’s your understanding of it? DB: I’d refer to what I said before: that you don’t need to be an expert in something to be able to have an opinion. LMS: Beyond that, I believe it’s about helping activists help themselves, about showing the possibility to do something without having to be guided throughout the process. Giving as less as possible to give people the feeling of ownership. 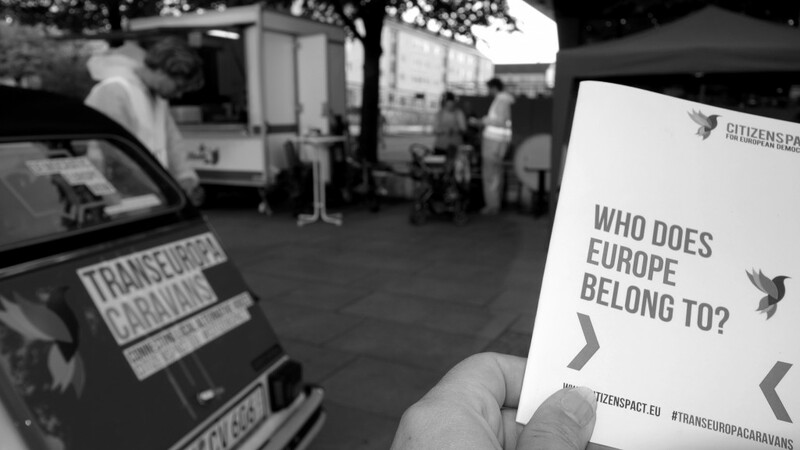 DB: An underlying idea of the Caravan project is its claim “Connecting local alternative voices”. We want to give people who are already active a European perspective for their local struggle, with us being the vehicle showing existing possibilities of participation. Realising that we all struggle with the same issues all around Europe. This is also what I’d call empowerment. One last question: what’s next, what’s the vision of EA? DB: We’re always facing the problem of being a multi-issue organisation and therefore always have to fight for our credibility on the issues we’re dealing with. Our vision is to give more people a voice through more members and activists. We’d be happy to become a mouthpiece for people in Europe, because we can represent different ideas and core values such as diversity, equality, democracy, solidarity, etc. These values need to be fought for such as civil rights, they always needed to be defended, it is important to us to do this at least Europe-wide but also beyond. And it is important to us that the perpetual crisis discourse doesn’t dis-empower people but politicises them in a way that they collaborate and actually change something about this status quo. If we can reach this with EA we are getting far. 3 German synonym for the ‘everyday man’, such as John Smith and Joe Bloggs. 6 Clicktivism describes internet activism, often criticised as lacking actual engagement with real-world issues. 12 Air Time was a one-off public performance during the Transeuropa Festival 2013 taking place simultaneously in different cities around Europe.